I bet most people would answer yes. Bullies can find any little thing to pick on, am I right? You wear glasses. You’re too skinny. You’re too chubby. Your feet are big. Your clothes are weird. You talk funny. Apparently, in Jesus’ time–the 1st century–bullying was like it is now. People got picked on just like they do today. Zacchaeus was short. Zacchaeus was a tax collector; Zacchaeus was rich. Tax collectors for the Roman Empire—yeah, they were pretty much disliked by everyone. Think about it. People did not like to pay taxes to the Romans. And they especially didn’t like someone who was not Roman coming to their house to collect taxes. People like Zacchaeus most likely had Roman soldiers for bodyguards just so they wouldn’t get beaten up. Add to this that many tax collectors skimmed off the top. They collected taxes for Rome, but kept some of the money for themselves. But in spite of this, the taxman Zacchaeus really wanted to see this Jesus of Nazareth character. But there were a lot of people surrounding Jesus. 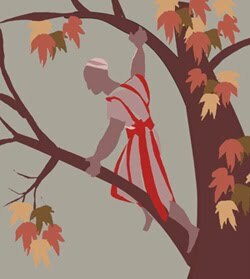 So Zacchaeus climbed a tree in order to see him, on account of the important detail that he was short in stature. Our perception of this story makes us think that he climbed a tree just because he was short. Maybe. But don’t forget: Zacchaeus was a tax collector and he was rich. He ran ahead of the crowds because he did not want to get beaten up. Maybe he climbed the tree so that no one in the crowds would see him. Being “short in stature” does not necessarily mean that he was 3 feet tall. Perhaps he could not see Jesus because the crowds wouldn’t let him. You see, people already assumed that Zacchaeus was a bad person just because of his title. But for some reason, Jesus did not. He saw Zacchaeus in that sycamore tree and talked to him. Come down. Hurry. I must stay at your house today. Really? With all the crowds watching? Zaccheus was so excited, he forgot about all this and welcomed Jesus’ request with open arms. Jesus will be the guest of a sinner. Humph. Meanwhile, Zacchaeus is eager to tell Jesus about himself. Look, half of my material possessions I give to the poor. If I’ve cheated anyone, I will pay them back four times what I owe them. Let’s pause here for a moment because there is something interesting to explore. The verb form of give to the poor in the original Greek language is in the present tense. But most of our English translations render it as will give. This makes a huge difference. If Zacchaeus will give to the poor, as our version says, then this is a conversion story. He was a bad guy and now he’s not. But if it is the present tense, then we’ve misinterpreted the story. What if Zacchaeus was already giving to the poor and making sure that he didn’t cheat people? What if he never really was a bad dude to begin with? Was he generous? What if his title of tax collector and sinner was the only thing that stained his reputation!?! I’m going with the present tense, because I think our Bible translations have tried to turn the Zacchaeus story into a conversion story when it is actually a last-first, small-tall story. What I mean is that just earlier in Luke, Jesus said that another tax collector who called himself a sinner in his own prayers was on his way home to find God’s mercy and that he was justified more than any religious leader who supposedly knew how to pray elegantly in public. And here we have another tax collector in Zacchaeus who is called a sinner by the crowds who have judged him without a reason to, other than his marginalized status in society. Zacchaeus was not the bully. He was being bullied! He was a generous man who was already doing the right thing. But nobody cared. He was a tax collector and therefore, according to the people, he was an awful sinner. Even though the name Zacchaeus means pure and righteous one, he’s painted as a cruel, selfish, greedy, businessman who must undergo a miraculous conversion in order to be saved. I just don’t think that this is the point of the story. Jesus already knew about Zacchaeus. This is consistent with Jesus’ movements in many Gospel stories. He saw him up in that tree and called him down because he wanted to show the people just how judgmental they really were. I mean, come on. Jesus knew exactly which tree Zacchaeus would climb and when he would be there. This is all a setup for a major teaching moment. Jesus was once again flipping over the assumptions of the crowds and calling out their prejudice. And so the story should be for us. One: the crowds are full of prejudice. 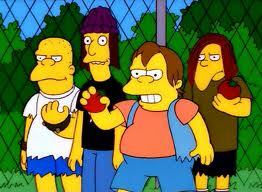 They have become bullies, even though they think that Zacchaeus is the bully. Two: Zacchaeus, in his suffering, doesn’t give up; Jesus knows where he is, looks at him, calls him down from the tree, and goes to his house. The story is a warning to all of us that we can become bullies. We cannot assume that certain people are lesser or undeserving of God’s grace. We just cannot do that. Ever. We should never bully someone—even if others do it and it seems popular. No matter what label or category exists for a person—we should never judge them. Each person deserves our empathy. We ought to accept people as they are without assuming things about them. Oh, how that is needed in our world! Friends, Jesus chooses to hold up characters like Zacchaeus as shining examples, even though they have been despised and bullied for a long time. Zacchaeus is another unlikely hero, but exactly the kind of hero that Jesus lifts up. So this is good news. This encourages us to keep doing the right thing, to keep spreading love and compassion to others, in spite of all the bullies out there who will try to tell us that we’re not worth it. Somehow, Zacchaeus still had hope even before he met Jesus. He did not despair, even though people tried to push him down. That is why he ran ahead and climbed the tree. That is why he jumped down from the tree and had Jesus over to his house. Zacchaeus, a wee little man? So we say…but not so much. Zacchaeus was not small, but tall. He was bullied but did not despair. He didn’t hesitate to show compassion and generosity even when no one noticed. And he found out—as we can—that God doesn’t ignore our suffering. God knows about all the bullying going on. God sees us as we are. God calls us out of the tree, down into the world, and God meets us at our homes. So don’t let the bullies discourage you from being generous and compassionate. God sees and accepts you as you are. Now do the same for others. Amen.